Another Syrian journalist murdered. MSM silent. Thaer spends the night in Damascus’ streets interviewing whoever he encounters, asking them basic questions like how they find Syria (we love it, its beautiful, Syria is our mother…), whether they are afraid (no), what they wish for (Syria to return to how it was before this mess started), and he jokes with them, teases them. Their answers mirror the resilience and gentleness of Syrians I saw when in Syria three times over the past year. 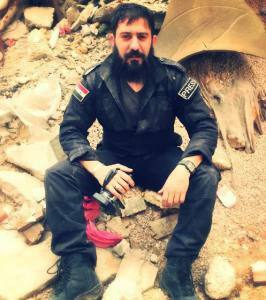 Another Syrian journalist killed while reporting on the terrorism of armed anti-government groups in Syria. Scarcely a peep out of MSM three days after his murder. Were this a Western journalist, you can bet that the headlines would be blaring outrage against this heinous murder. There is a FB memorial page for Thaer. CLICK HERE and share widely. It is important that the deaths of brave Syrian and other Arab journalists be recognized and remembered. “Late al-Ajlani, reporter of Sham FM Radio, was killed on Monday morning while covering the continued operations of the army and armed forces against Takfiri terrorist organizations in Jobar neighborhood on the eastern outskirts of Damascus City. ← Are the U.S. and Allies Getting Too Cozy With Al Qaeda’s Affiliate in Syria?